If you are looking for a pool, but not sure how to go about getting started, you’ve come to the right place. At NQ Pool Warehouse we look after the complete process for you. 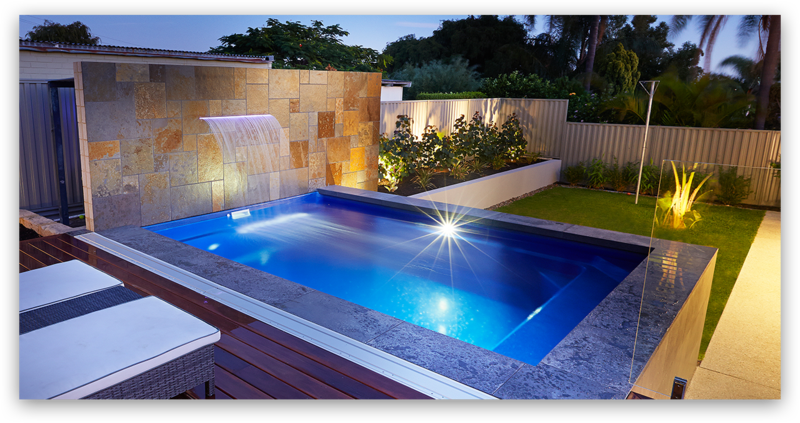 Not only can we supply you with a concrete or fibreglass pool, we can also organise the other details of your pool area, including paving, fencing, surrounds and water features. Our extensive variety of different pools and pool cleaning systems, means that we can build the perfect pool for you, one that suits your tastes perfectly. The traditional chlorinated pools work a treat, but there are also now a variety of different options for pool cleaning systems, including salt and magnesium. Our extensive range of fibreglass pools cater to every different taste, with something to suit everyone. The many different features available in the varying designs allows you to choose your pool based on what you intend to use it for. For those who have children, a popular option would be one of our designs that have extra in-pool seating. This allows space for parents with babes to sit in shallow water, while still allowing a deep area for those who want to swim laps. If you plan to use your pool for entertaining, we have a number of different designs that are perfect for relaxing as you luxuriate away those hot summer days, sipping drinks in the cool water. They say that variety is the spice of life, so we offer concrete pools as an additional option for those who want even more choice. Our concrete pools are designed specifically to suit the climate and conditions of the Townsville area, with its rich, clay, active soil, which can dry out during the warmer months. As it dries, this soil can cause shrinkage and settlement which could impact the life of the concrete pool, but we reinforce ours to ensure that your concrete pool lasts the tests of nature. If you are looking for something a little less permanent, or want something simple that you will still be able to enjoy for years to come, an above ground pool could be just what you are looking for. Our range of above ground pools come in 4 different shapes, so they can fit into any shaped garden area. For more information about our pools, contact us today and we can send you a brochure, or come and visit you in your home to discuss how we can help you get into the water as soon as possible.